You can picture yourself standing at the top of a deep chasm. Sheer rock walls fall away to nothing. The stone is hard and cold and you are wondering what on earth you are doing here, on the Cirque de la Solitude GR20 route right up at the very top of Corsica. The answer is simple. It is beautiful, so beautiful you want to cry. 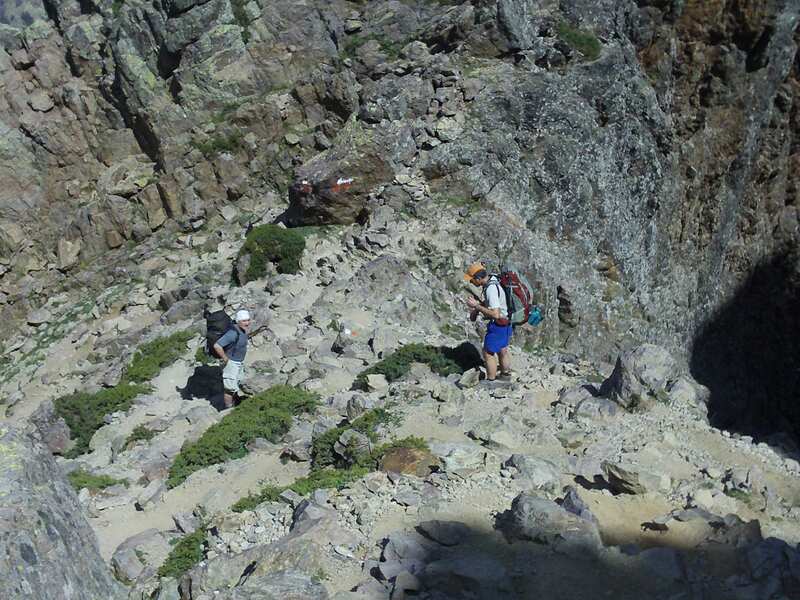 And you are doing it, the toughest marked hiking trail in Europe. And you know you will feel absolutely fabulous when you are done. But first you have to go down the Cirque de la Solitude and then back up again. Can you do it? Yes you can. I’ll tell you how. 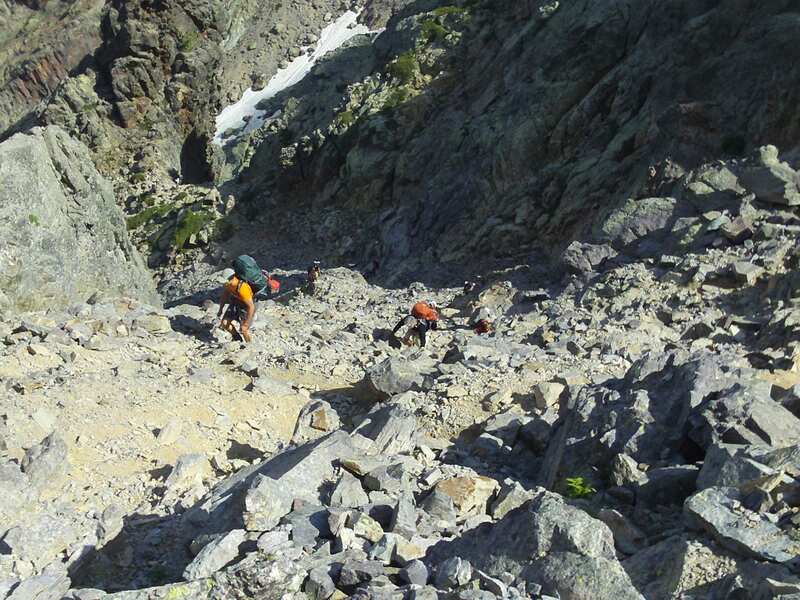 The first thing to remember about hiking the Cirque de la solitude GR20 is that you do not have to be a mountaineer to do it. 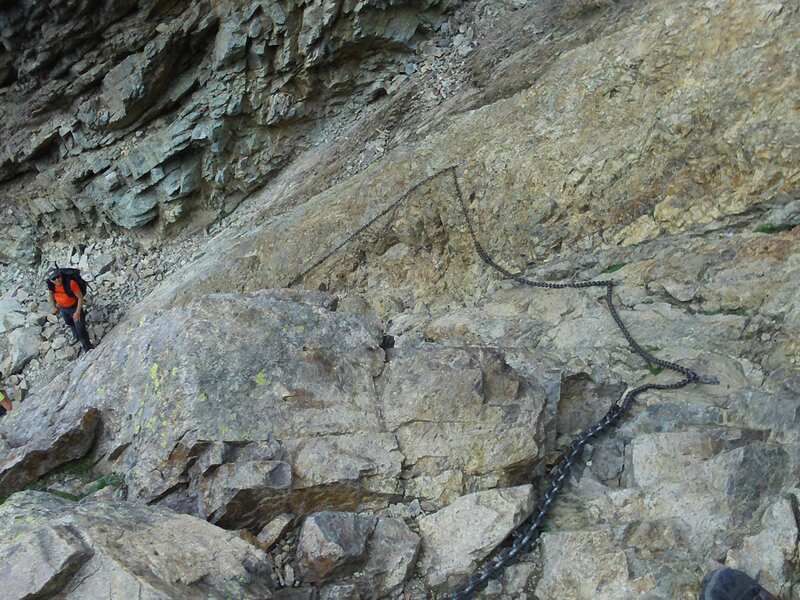 If you have experience on rock and have done trad climbing or scrambling you will probably enjoy it a whole lot more. But the truth is that there are enough chains and ladders on the hard bits that in good weather it really is not beyond the reach of most people. In my group were some people with no experience on rock and they managed just fine. In a group ahead of us, one or two of the people froze up and were terrified of the feeling of exposure from being so high up. Yet they still managed just fine by moving slowly and steadily. Try to get the timing right to go in good weather. If the rock is slippery and wet it can be really frightening and difficult. And you don’t want to run the risk of being exposed high on the ridges during lightening storms. Obviously you can’t control the weather, but be prepared to wait a day if there is heavy rain on this stretch. Go early in the morning. The weather is usually better in the morning (storms often arrive in the afternoons) and you may beat the crowds. Go slowly and steadily. Don’t rush if you don’t feel safe. Let faster groups go past if you feel they are making you nervous by pushing up behind you. Make sure only one of you is on a chain or ladder at a time. Two people on a chain will destabilise each other. Make sure you are hydrated and fed. It can get very hot on the bare rock of the cirque and it is demanding hiking up to it and then down, through and back up it. I made an elementary mistake in not eating and half way back up the exit of the Cirque I bonked and got shaky legs. Luckily my friends saw what was happening and shoved a few glucose sweets down my throat. Twenty minutes later I was moving along happily again.